A fourteen-month-old boy was brought for evaluation of developmental delay. His birth history was normal. He was diagnosed to have bilateral congenital glaucoma and underwent bilateral trabeculectomy on day six of life. He started having seizures from the age of one month. Seizures were focal, sometimes involving right and sometimes left upper and lower limb for which phenytoin and phenobarbitone were started. Despite good compliance with antiepileptics, he continued to have breakthrough seizures once every two months. Global developmental delay was present with developmental age around five months. On examination, bilateral facial nevus (port-wine stain) was present involving the entire face and extending upto the trunk and right hand [Figure 1]. Tone was increased in all four limbs. Power was normal in all four limbs with brisk deep tendon reflexes. Rest of the systemic examination was normal. A computed tomography scan of the brain showed moderate dilatation of bilateral lateral and third ventricles with severe bilateral cerebral atrophy. Evidence of bilateral gyral pattern curvilinear calcification (tram-track appearance) was present [Figure 2]. In the above clinical scenario, the findings were suggestive of bilateral Sturge- Weber syndrome More Details. 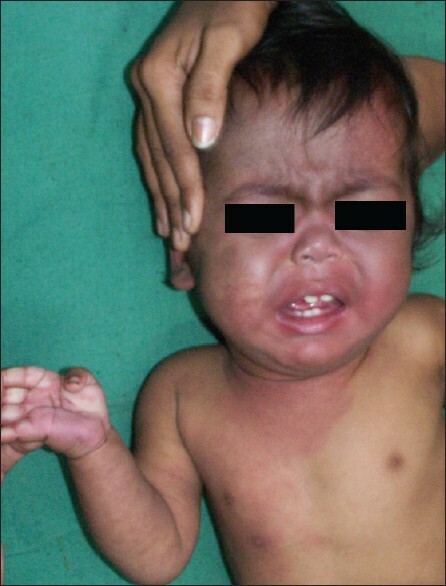 Sturge-Weber syndrome More Details (SWS), also called 'encephalotrigeminal angiomatosis', is a rare congenital neurocutaneous disease with an estimated incidence of one in 50,000 births. The most characteristic feature is the presence of unilateral facial nevus with ipsilateral intracranial calcifications. However, different variants of SWS have recently been reported in the literature. Our case is interesting due to the presence of bilateral facial nevus and bilateral extensive intracranial calcifications appearing before 2 years of age, which are seen in only 15% of cases. , The early onset of seizures prior to the age of 2 years is related to a poor prognosis with mental retardation and refractory epilepsy because of the larger involvement of brain dysfunction. 1. Haslam RH. Neurocutaneous syndromes. In: Behrman RE, Kliegman RM, Jenson HB, editors. Nelson Textbook of Pediatrics. 18 th ed. Philadelphia: WB Saunders; 2004. p. 2483-8. 2. Aydin A, Çakmakçi H, Kovanlikaya A, Dirik E. Sturge-Weber syndrome without facial nevus. Pediatr Neurol 2000;22:400-2. 3. Hobson C, Foyaca-Sibat H, Hobson B, de F Ibanez-Valdez L. Sturge-Weber syndrome Type 1 plus: Case report. Internet J Neurol 2006;5. Available from: http://www.ispub.com/journal/the_internet_journal_of_neurology.html. [Last accessed on 2010 Oct 30]. 4. Boltshauser E, Wilson J, Hoare RD. 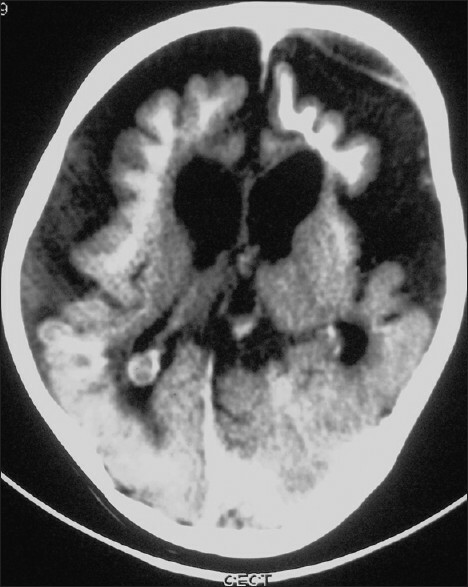 Sturge-Weber syndrome with bilateral intracranial calcification. J Neurol Neurosurg Psychiatry 1976;39:429-35.